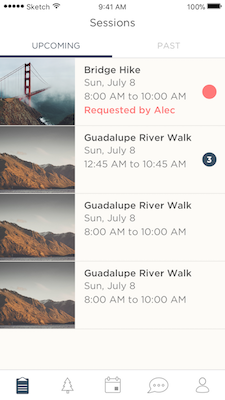 We created the Aide App to make it easy to manage your adventures and chat with your participants on-the-go. Our goal is to make the before and after process as easy as possible, so you can spend less time on your phone and more time sharing what you love doing outdoors. Create an adventure unique to your interests, choose a location, set your price, and lead sessions around your schedule. It’s entirely up to you. Use your knowledge and access of the local area to create original experiences that showcase you and your passions. Every adventure you create will require scheduled dates and times, also known as Sessions. 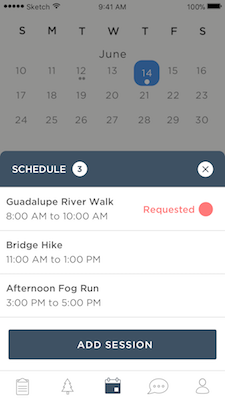 After your adventure is approved, you can scroll through the calendar to select the dates and times that work best for your schedule. Once added, your session(s) will go live on the app and be added to your calendar. At this point, any participant will be able to view and book your adventure. To make adventures more accessible and personalized, participants can also request your adventure at a day and time that works for them. It's up to you to accept or decline the request. If you choose to accept, the participant will be notified and given the option to confirm payment. Once confirmed, the session will be added to their journal. With session requests, there may be fewer participants booking, so set a rate you feel is worth your time. 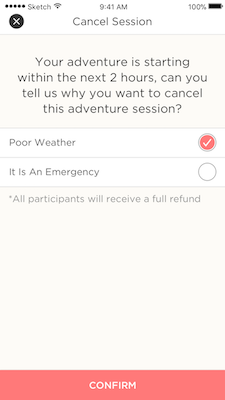 You can cancel any of your upcoming sessions up to two hours before the scheduled adventure. Whether it’s personal or weather related, we encourage you to message your participants directly to communicate the cancellation. This way, you can suggest a different session for them to book in the future! Three failed cancellations (cancellations not done at least 2 hours in advance) will result in the suspension of your account. The Adventure Aide crew will notify you of your account suspension and conduct a review of your status as an Aide. 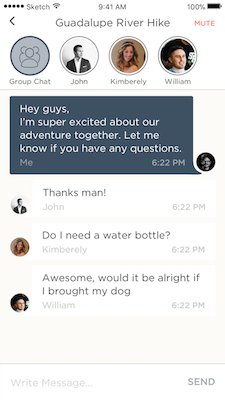 Separate from our Adventure Aide Crew Chat, our in-app messenger is designed for you to easily communicate with all of your adventure participants. You can message participants individually or communicate with the entire group at once. You will receive notifications for any incoming messages from your current or future participants. Your bio, experience, list of adventures, and ratings will appear on your profile. You can also view other stats and other information from your adventures. If you need to update your profile photo, bio, experience or access our Help Center, click the Settings gear in the right corner of your profile. We’re here to help! We’ve added a direct line to the Adventure Aide crew in your inbox and we are available whenever you need assistance.